I used to think this all the time. Then I got more nosebleeds. 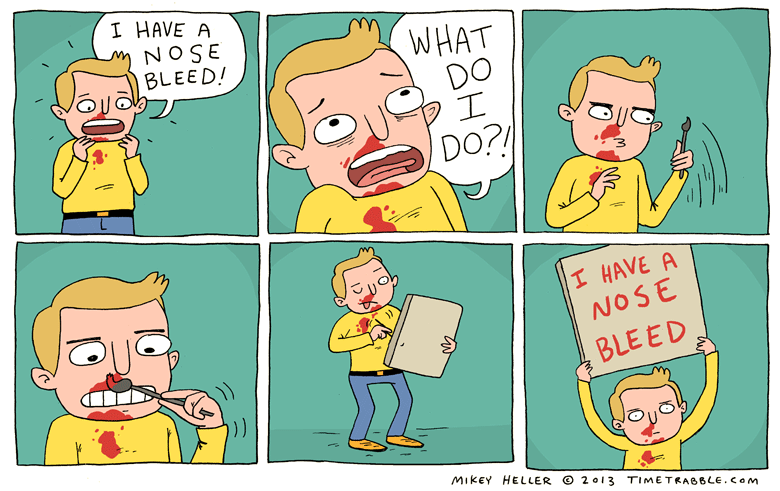 Now, when I have a nosebleed, nobody notices ’cause I’m so skilled. People need to learn this stuff. In school. Maybe during a class that wastes a lot of time like health or P.E. If it’s just bleeding a lot, let someone know you might need help. If it’s less than a mouthful of blood per few seconds, just keep calm and continue. This one can be tricky. When you are dealing with a small nosebleed, this isn’t really a problem if you keep the blood on your skin. (hands and chin, etc) But clothing, floors, etc need to be washed or wiped down. If you really want to make sure you didn’t leave blood anywhere, look everywhere you were for blood. (on the floor, over the sink, under it) Blood gets everywhere when you don’t pay attention. Once your nose has clotted blood in it, make sure you keep it that way. Don’t touch it. Let it be. You can pick your nose and whatever else after it has healed. Protip: There will most likely be a big red slimy booger. Take it out. If you haven’t found it, wait for it, it will most likely show itself, and will disturb clotting if you don’t take it out. If it’s not there after a minute, then it probably isn’t there.